For most Californians, it’s starting to feel like fire season lasts all year long — and it’s only going to get worse. The state’s fourth climate change assessment predicts that wildfire insurance costs will rise 18% by 2055 for the most at-risk areas, and it is projected that we’ll see a 77% increase in average burn area by midcentury when compared to the 1961–1990 period. But even as the fires are getting worse, smart entrepreneurs are coming up with new and better ways to deal with the increased risk. New technological solutions, including artificial intelligence, Wi-Fi networks and high-resolution mapping software, are emerging to help prevent wildfires and lessen the damage caused by those that do start. There are new cyber-infrastructure systems, such as WIFIRE from the University of California San Diego, which was designed to predict a wildfire’s path in real time. WIFIRE’s AI collects data from hundreds of remote weather stations in a given area and high-resolution satellite imagery routed through the San Diego Supercomputer Center (also at UC San Diego) to make its predictions. Currently used by a handful of California fire departments, it is being tested in more than 100 other jurisdictions. NASA’s Assistant for Understanding Data through Reasoning, Extraction and sYnthesis (AUDREY) system is being designed to keep first responders safe and to help them make decisions on the fly. The cloud-based AUDREY uses experimental technology, AI and machine learning to provide real-time positioning and hazard information to firefighters, EMTs and law enforcement personnel on the ground. NASA is piloting the system this year in California as well as in Washington, D.C., and Ontario, Canada. San Diego Gas & Electric uses artificial intelligence combined with a network of high-definition cameras to predict and stop wildfires. The cameras capture evidence of dangerous conditions while AI algorithms detect and turn off broken or damaged power lines before they hit the ground and spark a fire. The electric company also plans to employ AI to gather and analyze tens of millions of data points to help it predict and respond to wildfire conditions. Among those data points is information collected by a network of high-definition mountaintop cameras that scope out and assess fuel sources and can help track wildfires. Importantly, they also scan for the first signs of smoke plumes, providing an early warning that a wildfire has started. 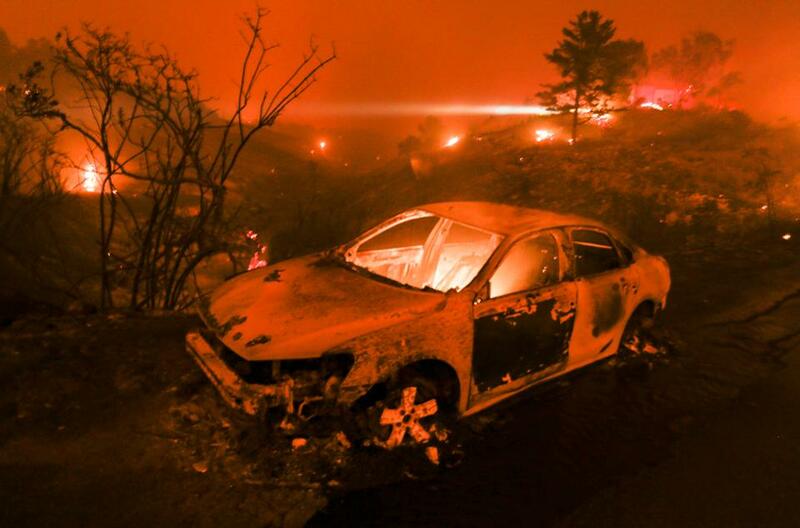 The cameras give officials — and first responders — up-to-the-minute data about fire-prone areas. Experts also are using ultra-high-resolution maps along with sophisticated computer tracking to create models that can pinpoint where wildfires are likely to start and better predict how they will move. Other models predict how destructive fires will be and what areas will be affected by the massive smoke clouds that they generate. The new models are already working: They tipped off officials last year to steadily rising fire danger, prompting them to activate emergency protocols a day before the West Fire broke out in July. Pacific Gas and Electric Co. plans to create a network of 600 of high-definition, pan-tilt-zoom cameras and 1,300 weather stations throughout its service area by 2022. The city of North Bay installed 16 cameras around town last year, some of which were funded by PG&E. Now that utilities are collecting all this data, they need to share it freely. Sumeet Singh from PG&E’s Community Wildfire Safety Program told a panel at a wildfire summit last month that utilities have to stop hoarding their data. Then, utilities and entrepreneurs need to work together to take these solutions to the next level. For example, many difficult-to-quantify factors affect how and when wildfires can start. AI can analyze past and current precipitation in a particular area but may need more sophisticated models to account for climate change. Although progress is being made, there’s still plenty of work to be done. And while tech advances can be used to help reduce the damage from wildfire risks, they can also give entrepreneurs an avenue to build new businesses. It’s in everyone’s interest (homeowners, insurance companies and government) to reduce the damage the state is seeing from longer fire seasons. That will inevitably lead to a worthwhile business opportunity. This article was written by Mike Montgomery from Forbes and was legally licensed through the NewsCred publisher network. Please direct all licensing questions to legal@newscred.com.